Popular Indian yogi Baba Ramdev, whose daily TV programme is watched by millions, has started his hunger strikes as a way to press the government to take action against corruption. He has raised the issue of Indian money stashed away illegally in Swiss Bank which is estimated to be anywhere between 1 to 1.5 trillion USD. He says that the government must take immediate action and bring back the money as it belongs to the people of India. Not only this he openly charges that this black money has been taken out of the country illegally and also very strongly demands a capital punishment to all those Indians or N.R.I.s, who acquire, handle and stash black money. Swami Ramdev declared that he will go on hunger strike from June 4, 2011 in Delhi and asked his followers also to join his crusade. He declared publicly that one of the main objectives of the movement is to root out corruption from India and bring back the black money stashed away in various financial institutions abroad to India and declare it a national property. On May 28, the government set up a panel to suggest steps to curb black money and its transfer abroad, in an apparent bid to placate Ramdev. Afterwards, Prime Minister Manmohan Singh wrote to Ramdev and requested him to cancel his fast, but Ramdev refused. He booked Ramlila ground of Delhi for 1 month in protest of black money and declared 4 June as start date of fast unto death. When Ramdev arrived at Delhi airport on June 1, four senior ministers of the UPA government met him on the Airport and tried to persuade him by telling government's initiative on corruption. 65,000 followers of the yoga teacher had gathered at Ramlila Ground. By noon queues extending up to 3 km from the entry point of Ram Lila Grounds and were seen chanting 'Vande Mataram'. In a press conference in the evening Kapil Sibbal made public a letter from Ramdev's camp to call off the hunger strike. 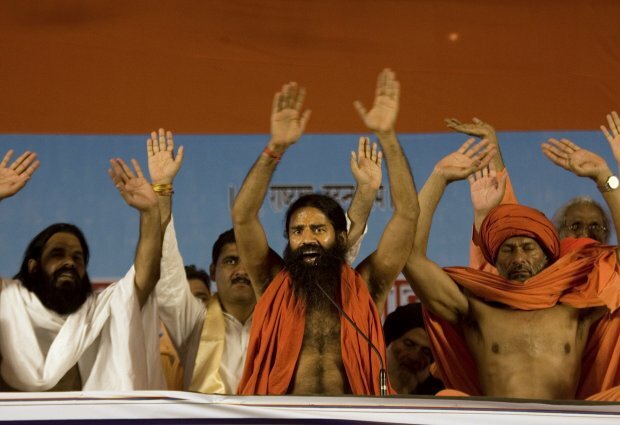 In the evening, Informer had told Baba Ramdev that thousands of policemen may try to clear out the tents. At the midnight, Delhi Police raided the ground when most Satyagrahis were sleeping and Ramdev was busy at a meeting with his core group. A large police force lobbed tear gas shells and lathi charged to evict the crowd from 1a.m. to 4 a.m. Police had arranged buses to drop supporters at railway stations and bus stands in advance; had ammunition ready and all the policemen were in battle-gear wearing vests and helmets and kept some ambulances on standby. Meanwhile, Baba Ramdev requested policemen that "Do not beat the people here, I am ready to court arrest"
Delhi Police kept Ramdev in a government guesthouse for a few hours and then sent him to his Ashram in Haridwar under police custody. Police fired tear gas, lathi charged people who were peacefully fasting. Also, Police ruthlessly beat fasting men, women and children to chase them out of the Ramlila maindan. Reportedly 53 persons were injured and were treated at the Lok Nayak Jai Prakash (LNJP) hospital, AIIMS trauma center and Ram Manohar Lohia Hospital. Protesters huddled near the Metro station, bus depots and railway stations. Many walked down to Gurdwara Bangla Sahib and other nearby Ashrams. According to New Delhi railway station authorities, supporters continued to leave in batches through the course of the day. While several supporters spent the day in a park near Ramlila Maidan, others took shelter in Arya Samaj at Paharganj. Baba Ramdev was taken by police outside Delhi and prohibited him from entering Delhi for 15 days. On reaching Haridwar, Swami Ramdev declared in a press conference that his fast unto death will continue. Ramdev accused the government of cheating him, and alleged that there was a conspiracy to kill him and that he was threatened during a meeting with senior ministers. It was even compared it with the Emergency and the Jalianwala. Apart from politicians, he was also supported by civil societies as well. A senior poet laureate Dr Madan Lal Verma 'Krant' wrote an article on his blog KRANT and said that the action of the government was more shameful than the Jallianwala of British period. He said that the British Government had ordered firing in the day whereas Indian Government took such a brutal action after midnight when all of the protesting persons were sleeping. Activist Anna Hazare termed the crackdown of the agitation a strangulation of democracy. He said: "There was no firing otherwise the eviction was similar to jallianwala bagh masscare ". He boycotted his lokpal panel meeting with the government on 6 June and decided to go on a one day fast on 8 June. His allies Arvind kejriwal, shanti bhushan, and Swami Agnivesh also criticised the police action to evict the hunger strikers forcefully. Protests were held in many different parts of the country. Protests were held in Bangalore, Mumbai, Hyderabad, Jammu, Lucknow among other several cities of India. After being evicted from Delhi, Baba Ramdev wanted to continue his fast from Noida but was denied permission by the Uttar Pradesh government. Many people like sri sri ravi shankar also forced him to end his fast. Ultimately, he decided to continue his hunger strike and Satyagrah at Haridwar only from 6 June 2011 onwards. Baba Ramdev ended his fast on the 9th day by drinking a glass of juice at Himalayan Institute of Medical Sciences where he was recuperating from the seventh day of his fast. After repeated request from Sri Sri Ravishankar and various other saints he ended his fast despite his demands were met. Political reactions came in from all major parties expressing their happiness about ending the fast. BJP Spokesperson Ravi Shankar Prasad said they have a "sense of satisfaction" that the fast has ended. Janata Party leader Subramanium Swamy said that the fast was "successful" and termed the government as "monstrous". While the ruling party Congress spokesperson Janardan Dwivedi gave a flavorless reaction by saying it as "good".